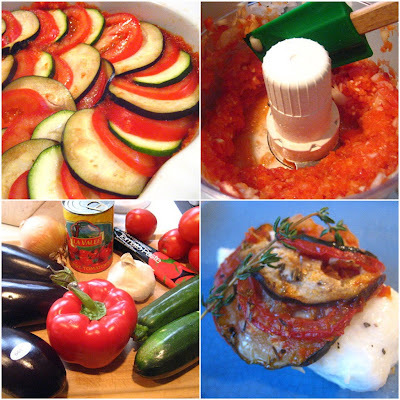 I love ratatouille, a traditional Provencal eggplant stew with tomatoes. I have been making it for years but always on the stove top. 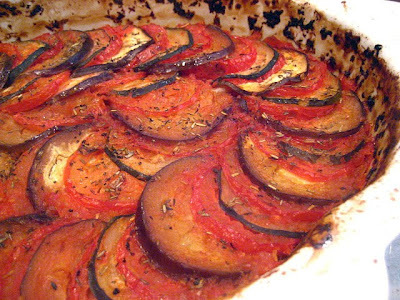 Recently I tried a ratatouille baked in the oven, more like a tian, and I loved it. I tried it at home and it was a much nicer way paired with fish like the beautiful halibut filets that I got at the fish market this week (finally!). This is a bit unconventional, but it turned out great. It was also delicious with scrambled eggs for breakfast the next morning! Make the sauce. (bossy, aren't I?). 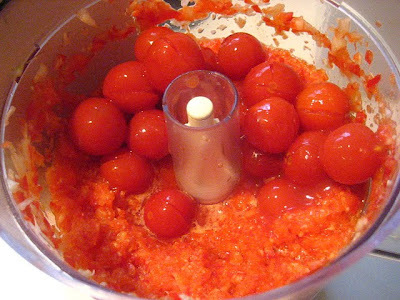 In a food processor, add the red pepper pieces, half the onion and the 3 cloves of garlic. Pulse a few times until breaking down. Now add the canned tomatoes that have been drained, and pulse until a nice sauce is forming. 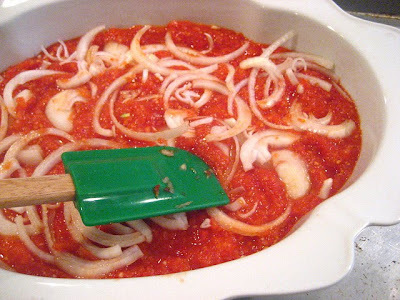 Spread the red sauce in the bottom of a large gratin dish. Lay the other half of the onion (that has been sliced) on top of the sauce. 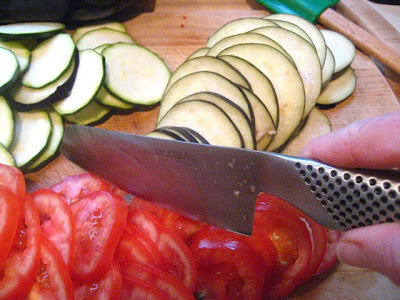 Lay your sliced zucchini, squash, tomatoes and eggplant on a baking sheet and sprinkle all with kosher salt. Layer these in a pretty concentric pattern over the tomato/red pepper sauce. Drizzle with olive oil and sprinkle w/ more kosher salt. I added herbes de Provence at the end to make more of an authentic Provencal dish! Press down with your hands so it soaks into the sauce, and add a piece of aluminum foil and press down to cover tightly. Bake about 2 hours at 350F. I like to finish it the last few minutes in the oven without the cover so it gets crispy looking. Serve as a base for fish or on its own. You are something else! Another absolutely beautiful dish which has caused my mouth to water at 8:20 a.m. - not the time I would usually be thinking about something other than oatmeal. Very pretty. Looks good raw and cooked! Just beautiful. This may become my summer go-to side. Never thought to do it in the oven. What a great idea! I have always done it the Julia Child way, very greasy and time-consuming and this sounds so much better! I will try your method next time ! I've always wanted to make one like this - it looks so beautiful spread out like shingles. Its beautiful! this recipe is a win win every time! Oh, I love this idea - It's actually a much nicer presentation than the typical stew. That's a great idea! I think I would like that better than the stovetop version which can get a little mushy for my taste. 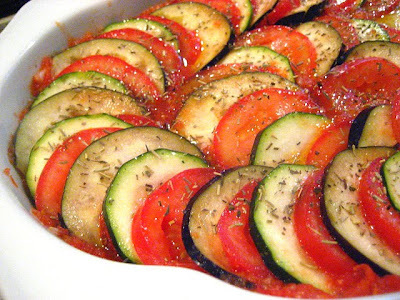 I've always loved Ratatouille, the old stove top way, can't wait to try this version. Great idea. Used to work with a woman, who became a very good friend, who was married to a pastry chef named Chris. Chris was working at Les Halles (w/wild man Anthony Bourdain) at the time. Anyway, when he wasn't cooking at work, Chris was cooking at home. One day, my friend brought in some ratatouille Chris had made and i tried some. So wonderful, better than ANY i had EVER eaten. I called him that night, and, his secret? He cooked every single vegetable, EVERY SINGLE ONE, separately, so they were all at their peak of texture and flavour before mixing them into a tomato-y stew. I've been too scared to make ratatouille ever since. When I was pregnant, Chris would send my friend into work w/ individual ramekins of flan for me. And he grilled me the best hamburger I ever ate on his backyard charcoal grill, using ground filet mignon from Smith & Wollensky, where he was then pastry cheffing, topped with unbelieveable aged cheddar. Them were the days. 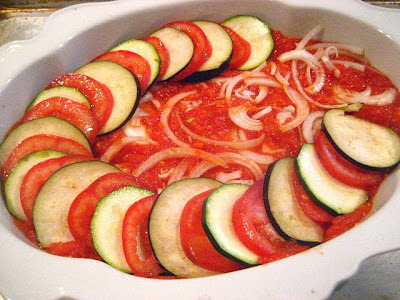 what a beautiful version of Ratatouille, the flavors must have been overwhelming! !